Cameron Cartiere is Dean of Graduate Studies. Cameron holds a PhD from the University of Arts London, Chelsea College of Art & Design and her dissertation examined the role of place-specificity in public art. She has an MA in Museum Studies and a BFA in Sculpture. She is a writer and researcher specializing in public art, urban renewal, sculpture parks, cultural heritage and curatorial practice. Cameron is the author of RE/Placing Public Art, co-editor of The Practice of Public Art, co-author of the Manifesto of Possibilities: Commissioning Public Art in the Urban Environment and the online resource, The International Directory of Sculpture Parks & Gardens. Cameron’s current research is on the sustainable impact of public art. 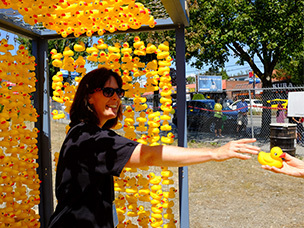 She holds a SSHRC Insight Development Grant for the research project chART:Public Art Marpole. The project focuses on community engagement, environmental and economic issues, and temporary public art.